A visitor arrives at your website to read an article. 3 weeks later you receive a payment notification telling you that they just bought the most highly priced product you sell. But here’s the magic: You didn’t do anything during those 3 weeks, yet the visitor moved through a perfectly crafted and optimized marketing funnel that did all the hard work for you. This is exactly what Ramit Sethi is doing to sell his premium courses and in this article we’ll take a deep dive into how he has built a conversion optimized funnel that is selling his products on autopilot. Ramit Sethi runs the enormously successful ‘I Will Teach You To Be Rich’. His website attracts over 1 million monthly visitors and has amassed over 800,000 subscribers to his mailing list. His primary source of income is selling online courses. He’s made millions of dollars from these products and his entire business is a well-oiled profit generating machine. Simply put: He’s a master of conversion strategies. Ramit Sethi's business is a personal brand with himself at the center. It’s always worth watching the masters. Whether you’re new to running a business or you’ve been at it for a while, it’s a smart idea to learn what others are doing and add their useful strategies to your own business road map. In Learn From The Master- Part 1, Hanne took a deep dive into how Ramit collects leads on his website. Since Ramit relies heavily on email marketing, it’s vital that he gathers a high volume of qualified leads who are interested in his topics including starting a business, the psychology of self-improvement, achieving wealth, and more. But what happens on his website is only half the story. Ramit’s dedication to sleek, scalable marketing continues beyond simply collecting leads. The other half is happening behind the scenes through his mailing list. The big secret? Automated Evergreen Scarcity. What is an Evergreen Scarcity Funnel? If you’ve joined Ramit’s mailing list, then you have seen the wisdom and value he offers in every email. You feel like he gets you. But what you might not be aware of is that after joining his mailing list, you are seamlessly placed into an evergreen funnel. This means you’ll receive perfectly timed emails that gradually convince you to buy his product which just so happens to be closing soon… all done automatically. It’s so seamless, I bet you didn’t even notice. Even as we dig into the cogs that make this well-oiled machine turn, there are times when it’s hard to know exactly how he does it. That’s how good marketing should be! It should be effective, whilst keeping out of the way. Time: Putting together an evergreen funnel can take a while. It requires pre-writing emails, landing pages, pre-access pages, etc. More time will go into preparing a funnel like this than into a regular product launch… but it sure can pay off! Complexity: There are a lot of moving parts that need to work together. Getting them to play nicely can be quite tricky. Fortunately, in this article we’ll also introduce how Thrive Ultimatum can create a similar Evergreen Funnel to Ramit’s. The good news is that these Cons are insignificant once you see the benefits of a funnel like this. It may be extra time and complexity up front, but you can reap the rewards many times over! So let’s get into the good stuff that makes a funnel like Ramit's work. When looking at a funnel like this, it’s easy to get caught up in the cogs of the machine and forget that fundamentally it’s still about providing a valuable product to customers. Ramit’s extraordinary copywriting skills make every email and salespage an interesting read. He always maintains a ‘Value First’ approach in his marketing, and you should too. One of the greatest obstacles to buying is the question “Why now?”. Procrastination is a curse that we’ve all suffered from at some stage, but when parting with hard earned money, it’s an even greater obstacle. Perhaps a potential customer is waiting until they feel ready, but there’s always another reason to delay. A good marketer will provide solid reasons why their product is worth buying now. One of the most tangible ways to do this is to create a deadline. Having a hard deadline encourages action. This could be a discount or coupon that expires, but in Ramit’s case he closes his course enrolments. If you didn’t sign up when you had the chance, then that’s it... Who knows when you’ll get another chance! Could Ramit sell his course straight from his website? Of course he could... but he chooses not to. Since this guy knows how to optimize his conversions, it’s safe to say that the reason he only sells through his mailing list is simple: It drives sales. There are multiple ways to use Scarcity in marketing, but an Evergreen Funnel like this requires the subscriber to be identified with their email address. It’s not just that Ramit wants to use email… it’s that he has to. By giving customers an option to buy and making it clear the opportunity is limited, Ramit incentivizes action. It’s not too difficult to create ‘once-off’ scarcity. You could simply add a countdown timer on a product page, and then manually hide that product once the timer ends. But we’re going further than that. It’s the automation of scarcity that gives an evergreen funnel it’s power. Automation is scalable. The more ‘hands-off’ your marketing can be, the more it can survive during high volume. Ramit’s evergreen funnel is completely ‘hands-off’. If 100,000 leads signed up on his website right now, there is nothing about this funnel that he would need to change or modify. The well-oiled machine will simply continue to do what it does best: generate sales. While smart marketing technology fuels this evergreen funnel, it never feels robotic. The way Ramit has set it up makes every step feel personable and human. 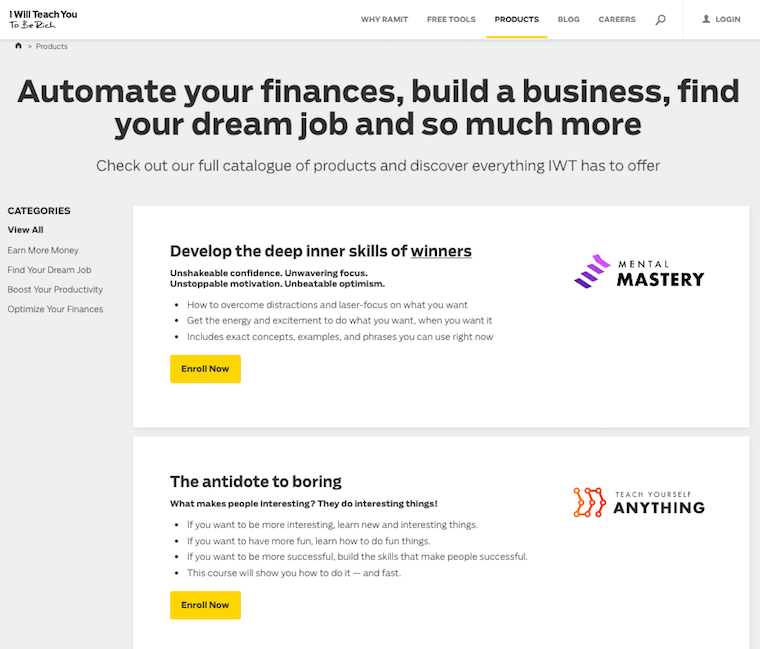 Now that you know the basics, let’s look at how Ramit Sethi has built a powerful conversion machine using both Scarcity and Automation to sell his premium course on starting a business, ‘Zero To Launch’. ​I Will Teach You To Be Rich is slick. At a first look, the homepage is very clean with only one Call To Action: to start a Quiz. This is only one of the many opt-in forms you’ll find throughout his site. 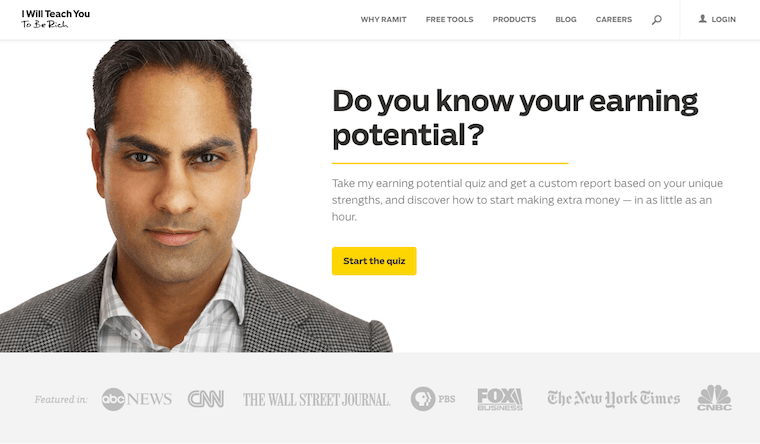 Ramit's Homepage has only one call-to-action: "Start the quiz"
As with everything Ramit does, his decision to have a Quiz on the front page will be driven by plenty of market research. If you take the quiz, it will end with a custom Opt-In form asking for your email address to send the results… and join his mailing list too. 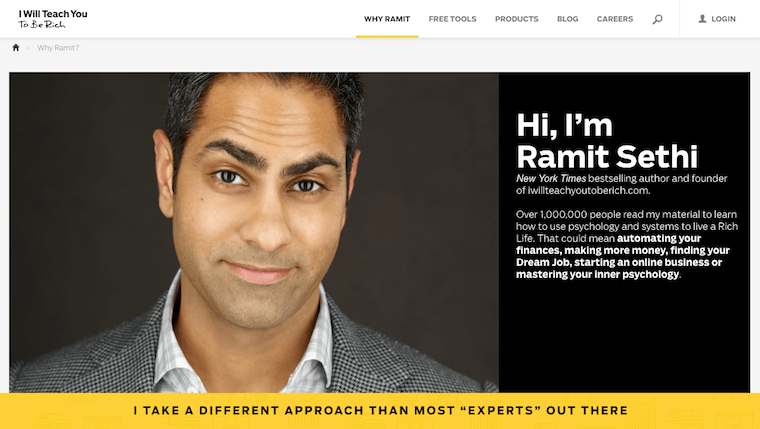 We’ve got another article that explores why Ramit uses a quiz on his homepage, and you can use Thrive Quiz Builder to do the same! Although Ramit's homepage makes his site look clean, behind the ‘Blog’ link, there are roughly 750 original blog posts all providing gateways for people to enter the site. Of course, these blog posts feature many different opt-in forms that invite visitors to join his mailing list. Depending which opt-in form you use, Ramit’s Email Marketing System will tag or segment you by interest (something you can also setup with Thrive Leads). This may influence what funnel you enter, and which products you’ll hear about in the emails you receive. If you entered his website through a form that relates to starting your own business, then it’s likely you’ll enter the Zero To Launch evergreen funnel. Since lead generation is already covered in detail in part 1: How Ramit Sethi Collects Leads, we’ll move along. Don't worry if you currently only have one opt-in offer and one product. While Ramit has 15 products, many funnels and advanced lead segmentation, you don't need all this to get started with your first Evergreen funnel! You can begin with one basic Evergreen Funnel for your best product. As you add more, you can implement different funnels based on subscriber interests. Listed under ‘Products’ on his website, Ramit has a short spiel about each of the courses he has built. Altogether it’s 15 courses and his famed New York Bestselling Book. The first 9 of his courses are available for enrolment immediately. These are the lower priced courses. The last 6 courses listed on this page (including Zero to Launch) say ‘Enrollment Closed - Join The Waitlist’. But don’t be fooled! If my Evergreen theory is correct, you won’t ever see these courses say ‘Open’! In fact, once you’ve joined Ramit’s mailing list he makes specific mention that he only ever offers this course to his exclusive subscribers. Why? Because it’s a highly priced product and he knows he’ll need to build a relationship with you first. Ramit's Zero To Launch will cost you $2000 USD. When was the last time you spent $2000 without getting to know the company you’re buying from and details about the product? Ramit is fully aware of the marketing challenge he has set himself. So if the course never opens from this product page, what’s the purpose of listing these closed products at all? Well, firstly it validates his business! That’s an impressive list of 15 online courses. But secondly… it’s yet another place to generate targeted leads. Visitors and potential customers wanting to learn about this course are directed to click that button and join the waitlist. What this really does is give the visitor an opportunity to subscribe to his mailing list, and tag them as interested in the product. This trigger will start an automation that puts them on track to receive targeted marketing and begin the evergreen funnel. If you click the Waitlist link, you’ll see what is known as a ‘Pre-Access Page’. Ramit’s version is generic enough that it can be used as an ‘Expired’ page as well. If you are using Thrive Ultimatum to create an Evergreen Funnel similar to Ramit’s, you’ll want to enable a ‘Lock Down Campaign’. This means a visitor who is not at the correct stage in your Evergreen Funnel cannot see your sales page, but will instead be redirected to a ‘pre-access page’. 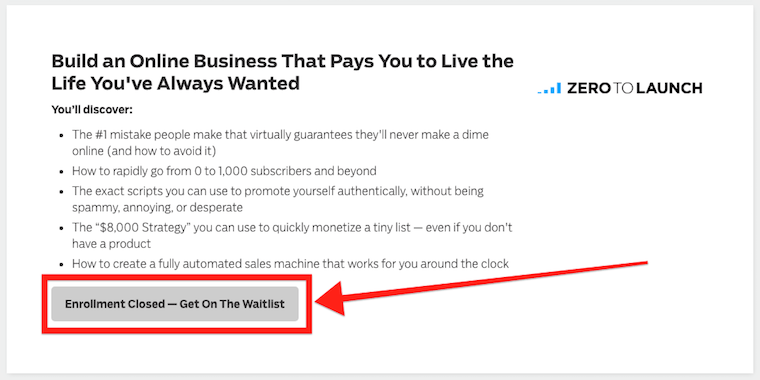 We recommend you create a dedicated opt-in form for this purpose just as Ramit has, inviting people to join your waitlist and enter your funnel. A touchpoint is any moment that someone comes in contact with your brand. That could include seeing an advert, visiting your website, receiving an email from you… any kind of interaction. This marketing theory suggests it takes 7 of these touchpoints before someone feels comfortable enough with your brand to make a purchase. Whether you believe that theory or not, the key takeaway is that potential customers are constantly evaluating you, your brand and your products. It’s unlikely that they are willing to buy on first contact. According to the same Google Report mentioned above, 70% of Americans look at product reviews before making a purchase. Potential customers are looking to see if they can trust you and your product before they buy. This concern increases with the price of a product. With Zero to Launch costing $2000 USD, visitors aren’t going to be swayed easily! This isn’t a product people buy on impulse. It needs to be an educated decision. What Ramit does so well is that he nurtures the relationship first, before selling anything. Upon sign up, Ramit’s Email Marketing System begins by automatically delivering a series of 6 emails over 8 days (not including the first confirmation email). This is known as a Nurture Sequence. To provide additional touchpoints: If the first email you get after signing up is a sales email, you’d probably hit the unsubscribe button straight away. Instead, Ramit gives you time to get to know him and his brand. To Build KLT- Know/ Like/ Trust: Ramit’s emails are funny. He talks about the value of starting your own business and he’s happy to have a laugh about life and entertain you at the same time. Without selling you anything, you really start to like and trust him. To Set Your Expectations: Ramit also has to prepare you for his marketing. When it’s time to really push a product, you can expect 2 emails per day. By sending 7 emails over the first 8 days you’re on his list, you come to expect him regularly in your inbox. To Prepare Your Mind: Any potential customer will be far more receptive to your marketing if they are already in tune with your message. In these first 6 emails, Ramit does not mention his products. There is no offer to buy. But he does get you thinking about starting your own business (which happens to be the topic of Zero To Launch) and how your life could change. With the groundwork set, Ramit has his subscribers primed. They are hooked, curious and already wanting to start a business. Remember the ‘7 touches’? Isn’t it curious that if you include his confirmation email, Ramit sends exactly 7 emails during this sequence? If you intend to sell a highly priced product, then you need to be ready for some sustained marketing. If that’s the case, you must use an Email Marketing Service that allows you to trigger a sequence of automated emails upon joining your list. Fortunately, this is a feature offered by almost every Email Marketing Service available today. But for further recommendations you can read this article by Shane over at Active Growth comparing different Email Marketing Systems. After 7 nurture emails have arrived in your inbox, there are 2 more to come. These are slightly different. For the first time, Ramit is referring to a specific product. In this case, it’s Zero To Launch. Although it’s not available to you yet, these two emails are there to connect the message from the previous 7 emails to this specific product. It’s also worth noting that the first 7 emails were somewhat generic. Yes, they were about starting an online business but none of them mentioned any of Ramit’s products. Depending on how you tag or segment someone inside an Email Marketing System, the product ‘Tie-In’ emails you send could introduce a different product. Then, after 2 emails that tie the message of the first 7 emails to the product... Ramit’s ‘Zero To Launch’ course suddenly becomes available to you. ...right when you want it most. COG FIVE: THE EVERGREEN LAUNCH. What happens next is some heavy marketing. Ramit is a master of copywriting and you’re about to get 8 emails over 5 days. And as he says in the first one, he’s unapologetic about it. ​“P.S. Yes, I’ll be emailing you more over the next few days, and I’m unapologetic about it. Zero To Launch is a serious investment. A lot of us “dabble” and dream about trying an online business, but when presented with the opportunity, we shy away. Now let's look at the subject lines of each email in his launch sequence. They read like subheadings on a sales page and in a way, that’s exactly what they are. If you want to read the content of these emails, just head over to I Will Teach You To Be Rich and sign up to Ramit's mailing list. Sure enough, you’ll see this funnel working in realtime. Ramit's Evergreen Launch: 8 emails over 5 days. Each email packs a punch with a different copywriting technique and there’s always a Call to Action to click a link that takes you to the Sales Page. He really pushes hard for you to click that link! And if you do? You’ll arrive at an excellent sales page featuring a countdown timer… just to hit home that scarcity! “It's Time: Start your online business with Zero to Launch” - This announces the course is open with a Call to Action right there in the subject line. The email introduces what exactly the course is and how it works. “Is this right for you? Let's see” - Here Ramit relates the content of the program to the reader’s situation. Remember how the nurture sequence primed subscribers to want to start a business? Now he’s offering a solution. “If You’re Scared, Read This” - Ramit addresses any doubts that readers may have about the value of the program, whilst also encouraging them to rise above their concerns and invest in themselves. “Sneak Peek: Live Salespage Teardown from Zero To Launch” - Here he allows readers to see some of the material in the course and get an idea of what it will be like. A great trick to alleviating any concerns. “How to afford Zero To Launch” - Remember it’s a $2000 investment, so Ramit explains the payment plan option and why this course is worth that price tag. His biggest promise is that if you follow the program, you'll make more than the investment back in profits. “The ‘Amazon Reviews’ of Zero To Launch” - This is where you’ll see loads of social proof, testimonials, examples and reviews. He's offers lots of transparency in this email. “The Zero To Launch Hard Sell” - It takes so much confidence to write that subject line that this email just begs to be opened! Again, he’s unapologetic about selling to you and it’s his faith in his product that helps. “Zero To Launch Closes at Midnight - Did you decide?” - This is the final scarcity push. By putting this right in the subject line, subscribers know that it’s now or (potentially) never. There is such urgency and confidence in these emails. They are brilliantly written and it’s a very powerful pitch. Sure enough, during this sequence the course sign up page is made available… only to you. If you open an incognito window and visit the Zero To Launch product page, it will still be the pre-access page that says ‘Zero to Launch is closed’. All of this marketing is happening through email. Your only gateway to that landing page is through the links provided in the emails, and the scarcity technology behind the scenes will make those links useless outside of the Evergreen time-frame. And although you probably think it costs thousands of dollars to develop a Ramit-level evergreen system for your own online business, guess again! Thrive Ultimatum's evergreen lockdown feature does the same thing. Firstly, when you create a Lockdown Campaign, Thrive Ultimatum will generate an Email link that works with your email marketing system. When you include this link in your emails, it will be customized to each subscriber, creating a unique timer that works only for them. Secondly, you’ll need to entice a subscriber to click that link to begin the campaign (that is, if you use the trigger type ‘Visit to Promotion Page’). Once your subscriber clicks that link, Thrive Ultimatum will start their campaign for the designated time. Let’s say it’s 5 days. Thirdly, you’ll need to trigger your sequence of marketing emails to begin upon link click for that specific link. This means that the same time Thrive Ultimatum begins a 5 day countdown, the subscriber starts 5 days worth of emails encouraging them to take you up on your offer. Do you want to create a funnel like this, but are unsure about how the technology works? Let us show you how to set it up for yourself! We have a free online video course in Thrive University on How to Build an Evergreen Sales Funnel. We'll show you how all of the technology works with your Email Marketing Service so you can wildly boost your conversions! Sign up with the button below to get the screencast of Hanne building an evergreen scarcity funnel like this! I'm already a Thrive University member, take me to the course immediately. Have you ever bought a product and then continued to receive emails or marketing trying to get you to buy the thing you just bought? Isn’t it just… so… annoying!? If you choose to buy Ramit’s Courses, you won’t see any of that. Upon purchase, the checkout system that Ramit uses passes a tag or contact update through to his Email Marketing System recording the purchase. As soon as a purchase of the product is recorded, that contact will be removed from the sequence of marketing emails and placed into an On-Boarding Sequence. An On-Boarding Sequence is similar to a Nurture Sequence but it’s there to help a customer make the most of their purchase. These emails would thank them for buying, welcome them to the program, and give them valuable instructions or tips in the coming days or weeks after they’ve received the product. To make this work, you need to use a checkout system that can pass a tag or instruction to your Email Marketing System upon purchase. Use that to trigger an exit from the marketing sequence. Fortunately, most online checkouts should have this feature. If not, then an easy Zapier integration should do the trick. With Thrive Ultimatum you can also set a ‘Conversion Page’. If you redirect a visitor to this page upon purchase, Thrive Ultimatum will close the campaign and hide any ribbons, widgets, or countdown timers from that visitor. If you don’t purchase Zero To Launch, Ramit Sethi will begin to email you less frequently and the content won’t be as specifically geared to that product any more. You’ve been blasted with 8 emails in 5 days encouraging you to buy and now it’s time for Ramit to cool off and show that he still values you on his list, whether you bought or not. What’s likely happening here is that you’ve completed the 3 week Evergreen Funnel Automation and now you have been moved to a ‘Broadcast list’. From there, you would receive regular emails with updates just like every other subscriber on his list. Ramit returns to delivering enormous value to your inbox on a regular basis and if you felt assaulted by the barrage of marketing emails you’ll quickly forget them. His emails are back to what they were in the nurture sequence: funny, relaxed, and interesting. No more selling for a while after the evergreen launch ends. It may be worth having a ‘cool down’ sequence as well, something to win back the subscribers trust if they don’t buy. You can even ask for feedback about why they didn’t. Once on your regular broadcast list, you can market other products or services... but what if that subscriber started receiving another product push right after the evergreen ends? By putting them in a ‘Cool Down’ sequence for a week or two before moving them to regular broadcasts, you can rest assured knowing they won’t read any heavy marketing emails for a reasonable amount of time. Evergreen Scarcity Funnels like Ramit’s are powerful, complex beasts. Even Ramit suggests that you shouldn't make one until you have confidently launched your products and seen that they are working first. Automated Email Delivery: The ability to trigger a new sequence on an email link click. Tags or Segmentation: The ability to add, tag or segment subscribers after purchase at your checkout. The type of Scarcity we’ve explored here is an Evergreen Lockdown Campaign. You can read more about how you can do this and more with Thrive Ultimatum here. Start exploring scarcity discount offers, fixed date campaigns and adding countdown timers to ribbons and widgets across your website. Are you ready to build your own Evergreen Machine? Leave a comment to let us know what you think of this marketing strategy, or if you have any questions about how it all works! P.S. Don't forget to sign up for the Free Video Course: How To Build an Evergreen Funnel. Yes. That’s great stuff. What would be really cool: if Thrive could add all his templates to the Library for download and implementation. I am talking about the Pages (Layout/Design) plus the connected E-Mails. That makes it much easier to implement funnels. I can speak for myself only. But I don’t need to create Designs, I am more interested to copy and paste designs, change logo and color. Much higher value is the process, and using templates ready to go. Great idea, Bernhard! Thrive has it for a three-video sequence, but it would be nice to have a full evergreen funnel set. Hi Martin, I am still learning about sales funnels and have Thrive Architect, which I haven’t managed to successfully implement yet. I do need scripts. Whereabouts is the three-video sequence script? I used it 4 years ago. It’s still just as effective. Glad you like it, Bernhard! I can see the value in having templates for different funnels, and we already provide a whole bunch of landing page sets. But as far as Ramit’s funnel goes, there are only 2 required pages: The sales page, and the ‘course closed’ page with an opt-in. All the other marketing happens through his email service. Though I’d like to investigate how nurture sequence emails vary between different marketers, products and niches. I hesitate to launch this kind of funnel because, even without rendering judgment, there’s an ethical question to a funnel like this. Again, I’m not here to say it’s one or the other, only to raise the point. I know what you mean, Chris. I’ve had this concern myself and I agree it’s important to think about the ethics. I think it’s better to frame the offer as ‘It’s just for you’, or a ‘special invitation to join the program’. Then I don’t think it’s misleading because it subtly says that the offer isn’t for everyone at the same time- it’s unique to them. 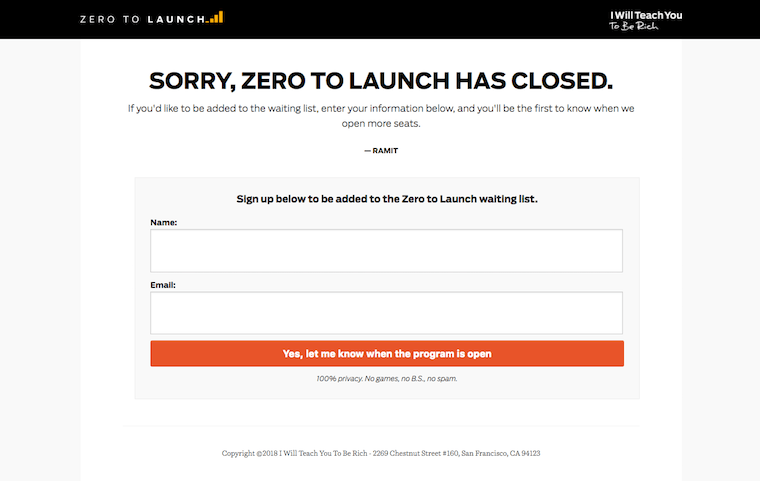 I don’t know….the language of “zero to launch has closed” and “get on the waitlist” is pretty misleading…followed by the final sales email saying “closes at midnight”…I mean, it’s just not true, and that makes it a lie. The question then is whether the lie is justifiable. And I think it’s a stretch. I 100% agree with Chris here, and came to the comments looking if someone had bring this up. For me, it’s the elephant in the room and I was expecting you’d address it in your (awesome) article, Bradley. False scarcity is what totally stops me from doing this. There’s no question I’d start a relationship with a future customer or true fan by telling them lies. So, what’s a way you’d suggest doing this in a honest way? Online courses are NOT scarce per se, unless there’s a group thing going on and you need fixed dates (then it’s no longer “evergreen”, and Ultimatum can’t do it unless having multiple individual campaigns). You suggested the discount coupon, but I don’t do discounts (actually ThriveThemes doesn’t either, Shane explained it the other day). I’ve thought about offering a special bonus, maybe this is the only option? Any other ideas? I’ve wanted to do this since some time now but just can’t figure it out yet. Based on some of the comments here we’re working on a follow-up post about how to add scarcity to your online business in a “legit” way and avoid the scammy feel of false scarcity! The offer isn’t false if it’s not open to the general public in my book. I think it’s completely ethical to have an evergreen offer that is time sensitive for a new subscriber or for someone who qualifies by having signed up on a wait list. It would be different if the page wasn’t protected (through a conditional timer that reverts to normal upon expiry) and anyone could access it at any time for the same price. It’s a common practice to grant a “members-only” discount, this is essentially based on the ‘merit’ of a member taking an action or paying money that separates them from those who won’t. Is that shady? Or smart business that rewards the people who actually take the action you want them to take? If you agree that it’s smart business, then realize that having a contact qualify themselves by ‘raising their hand’ to be on your wait list is essentially the same thing. If having a program as “closed” feels unethical to you, it can be avoided by having a general sales page at a higher price and extend a scarcity based discount through a limited time offer instead. The downside is not having a wait list requires you to spend more time warming up contacts via a general lead magnet/content upgrade or newsletter to eventually direct them towards an evergreen sequence for a relevant product with a limited time offer discount. In such a case, are we really adding value or just making our contacts wait longer before they’re presented with a viable solution to their problem? If I have a prospect who wants what I have and is willing to wait in line to get it, I’m happy to give them a discount and short cut their access (ironically via a ‘wait list’) rather than force them down a more generic ‘gauntlet’ of a nurture sequence that eventually leads them to the same place. I don’t see that as being unethical in the slightest; but actually saving them time by providing a solution they want in a more efficient manner. I like your thinking Michael, and I agree. There are definitely ways that scarcity can feel misleading, but then there’s also ways to do it ethically. On my own mailing list, I’ve implemented something very similar to what you’ve described. My products are open to the general public every now and then for a set price, but if someone joins my mailing list and takes certain actions in response to my emails, then they are invited to join outside of the public availability. But they have to have shown a certain behaviour first. The way I see it, it’s rewarding people for being responsive and interacting. Not everyone qualifies. Thanks for your comment and for expanding the conversation. The link to the Free video course on how to build an evergreen funnel doesnt work. Hi, thank you. I have added my details for the free course and nothing happens. Then Im forward to the page of the university and I dont have access. Hmm. Are you maybe already a Thrive University member? If you are, then you don’t need to create an account through that link and can straight to the course homepage here. Such a nice post! It propose So much valuable information and actions. Thanks for all your effort. I have immediately signed up to his course to have some kind of template to start from, once my course goes live. Thx for sharing it, as always, superb quality. You’re welcome, Philipp. I’m glad you found it as interesting as I do! Excellent article. I knew most of the principles and techniques, but putting them all together in this very clear walk-through makes the whole strategy much clearer. I feel as though I could implement these steps, using the article as a task list. Thanks! But there are two very confusing parts, where you give graphics listing the emails in Ramit’s two sequences. It took me until the second sequence to figure out that you’ve listed them in reverse order in each case, and I needed to read them from bottom to top. This might be how you read your own emails, but many don’t, and taken out of context there’s no reason to suspect they should be. Since understanding the sequence strategy is crucial, I suggest remedying this in the article. Oh, thanks for pointing that out, Tim! I might make that correction. Yes, the view is of an email inbox when the first emails in the sequence are pushed to the bottom and the newer ones at top. The curse of knowledge- I didn’t even think twice about the reverse listing. Brad, thank you for this article. It’s easy to read and actionable. I tend to keep close to all Thrive articles, but the Campaign Lockdown feature of Ultimatum caught me by surprise. Is it a full-fledged substitute of Deadline Funnel? Thanks Martin! Yes, the campaign lockdown feature is what really makes Ultimatum powerful. We’ve actually got a whole article that compares Thrive Ultimatum and Deadline Funnel with particular mention of evergreen lockdown- well worth having a look! Thank you for another great post. I’m familiar with Ramit’s work and love your plugins. I wonder something else. My customers still pay by bank transfer (99%) and the only option I could find was WooCommerce. I tried to use your themes for my shop, but it didn’t look nice, so I had to use their Storefront. (I don’t like it). So … I have 3 blogs with some simple funnels for different books and courses. After someone finishes the journey, I take them to the 4th site where I run a WooCommerce shop and membership area. If someone buys, there’s no way to tell Ultimatum to close the campaign for this customer. I can’t figure it out how to use Ultimatum, and your other plugins like Thrive Leads for this site. Any ideas? 1) If Thrive Ultimatum is used inside a subdomain, then the campaign triggers and conversions also have to happen within that subdomain. That means that you can still use the campaign trigger “On URL visit” to a page inside your WooCommerce subdomain to start the countdown, and then you also need to use a ‘Thankyou For Purchasing’ conversion page inside the same install. I would build the salespages inside the subdomain for that reason and link to them from your blog sites. 2) You can build a Sales Page on any of your 3 blogs, and use Ultimatum timers on those pages. Then direct the ‘buy now’ button to a checkout on the WooCommerce subdomain. Once the countdown expires, the ‘buy now’ link disappears. The idea is then to hide the product on WooCommerce so people can only find it with the direct link from your sales page. Hope that gives you some ideas and points you in the right direction! Bradley, thank you for your ideas. It still seems pretty complicated but I will experiment and see how it works. Thank you Bradley for this very informative and “actionable” post. I am a long time customer of Thrive products and I think Thrive adds more value in regards to how to make the internet marketing process work, and effectively use the great products they make, than virtually any other company out there. By connecting all the dots in a real life example you have given me exactly the type of guideline that I need. Again, many thanks to you, Shane, and Hanne. You’re welcome, Barry! Having powerful marketing tools is certainly the first step, but knowing how and when to use that power is just as important. That’s what we’re trying to help marketers do. Very nicely done Bradley. Good to have a behind the scenes look at Ramit’s funnel. Thank you Mohit! I’m glad you found this as interesting as I did! Thank you for such a magnificent piece of content! This analysis is a great way to teach us quite a few things. 1- We are learning from a master, as you said. 2- We are learning how to reverse engineer high converting funnels. 3- We are given the opportunity to benchmark and adapt proven and ethical marketing techniques. Thrive Themes provides great content, a marketing school (Thrive University) and conversion focused plugins all in one place. Hi Bradley Stevens. Thank you so much for sharing this excellent, on target information! How is this strategy different from the product launch formula from Jeff Walker? This is one of the best articles of all time. I learned series of ways I could sell my services online. I really feel like I have learned Goldmine topic. Thank you Yusuf! I’m note sure if I’d say ‘all time’, but I really enjoyed diving into the research and writing this piece. Enjoy the Goldmine! Thank you very much for this inspiring post: I am “under fire“ now! Wow. I’m already a long-time customer of all of the Thrive Products, and I’ve been listening to podcasts and researching evergreen funnels for weeks and this is an epic article and WOULD HAVE converted me into a Thrive customer… if I wasn’t already one. Great read. SUPER useful and introduced me to another epic marketing guru to look up to in Ramit, who seems to have a good level of ethicality in his evergreen sales funnel model. This is an excellent post with loads of actionable content (the only way to go) and I’ll be using the Ultimatum Tools to build out my funnel, help incentivize my customers so that I can better serve them in the super-useful courses I’ve created! Thanks so much! The whole time I was reading this I thought it was Shane. Glad to see he’s not the only one at Thrive who can create this level of content. Thanks Nick! I loved writing this article and I’m stoked that you share my love of the topic. I’ve managed to build a funnel very similar to this one using Ultimatum, so let us know how you go. I’m the newest member on the team, but we’re all marketing nerds here, so you’ll see more of my blog posts coming soon! Thanks Bradley, for sharing this amazing and valuable post with the To DO’es. Love to share your Post on my social media. for sure, I will start funnel soon.